Victoria BC, May 28th: Four seconds over five kilometres is not a great margin, but when it’s four seconds over a 7th-place Tour de France finisher, well, that’s sweet. Metchosin’s Ryder Hesjedal was the first man out of the block at the inaugural Kona Russ Hay’s Time Trial, setting the time to beat at 6 minutes, 53.8 seconds and the time stood until the last rider, Victoria’s Rob Britton (Brissell Pro Cycling Team) shaved off four seconds, finishing in 6 minutes,49.8 seconds. Vancouver’s Laura Brown (Local Ride/Dr. Vie Superfoods+) was the top female cat 1 rider, finishing in 7:48:0 with Victoria’s rising junior star Annie Ewart (Trek Red Truck Racing Team p/b Mosaic) second in 7:57.0 and Olympian Erinne Willock (Team Tibco/To the Top) third in 8:04.2. More than 100 racers participated in this augural race along Victoria’s scenic waterfront. 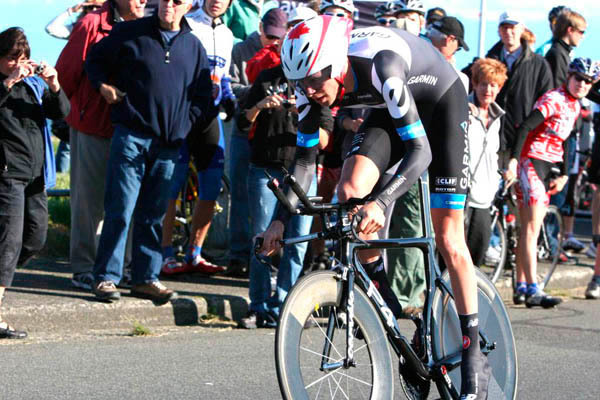 The time trial is part of the Robert W. Cameron Law Corporation Cycling Series which finishes tomorrow with the Condo Group Bastion Square Grand Prix – all part of the Victoria International Cycling Festival, presented by Harbour Air. For Hesjedal, it was a long day which begun with him leading 1,200-plus cyclists through the Ryder Hesjedal’s Tour de Victoria ride, the time trial and scores of media interviews and other engagements. Hesjedal is virtually on a "tour of cycling duty" being back in his hometown this week for the Tour de Victoria and other events before heading back to Europe for the Tour de France and Tour de Spain.